Garlic rust seems to be a big problem at the moment with the weather, with everyone suffering or at least knowing someone who has. Rust is a fungal disease that attacks garlic, however it can affect leeks and onions in a bad year too. It causes yellow/orange dots on the leaves of your plants, these then multiply and join together to make the leaves look almost orange in colour. The leaves will start to wilt and then die off prematurely, this can reduce the size of your crop if you don’t act quickly. Rust spores travel by air and love damp, warm weather, this lets them multiply faster than you can imagine. There aren’t really any cures for rust, your best bet is to try and slow the problem and give your garlic bulbs time to swell. One method to do this, is to remove all the leaves which have rust on them. I cut them off and burn them, don’t put them on the compost heap as they will over winter there and you’ll just spread them around the plot with your compost next year. Even if you take all the leaves off the garlic plant, the bulb will still be able to swell (even though it will look a bit sad for itself). You shouldn’t need to lift your garlic any earlier than usual, unless they are almost covered in rust and starting to die. Don’t forget you must disinfect your secateurs after using them on affected garlic, and also wash your hands before touching other crops as the spores will spread with your touch. Another method to try and combat rust, is with alcohol! Yes thats right, alcohol. Apparently the alcohol helps to kill the fungus. 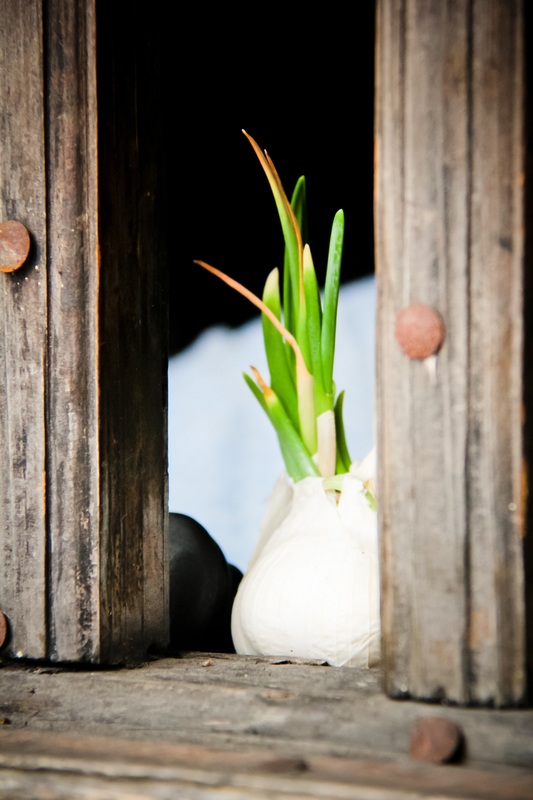 Any spare bottle of booze you have left over from christmas could help your garlic. Now, I’m not saying to use your nice gin, god forbid! But, how about using that bottle of weird stuff your auntie brought you back from holiday 5 years ago? I’m actually using something that smells like ouzo, its been in the cupboard for years and now its getting sprayed on my garlic. Make sure its not a liquor, baileys sprayed all over the plot may not have the same effect….. I’ve never tried this before, so I’ll keep you updated on the results. Garlic that has been affected with rust is still perfectly edible, just make sure the affected leaves are removed and the orange blotches haven’t infected the bulb. The main thing you have to do if you suffer from rust, is to move your crop next year. New soil each year and generous spacing will help to combat the fungus, also make sure your garlic is in the sunniest place you can find and make sure to check regularly for signs of infection. Rust will stay in the soil for 2 years or so, therefore make sure you rotate your crops, don’t put onions, leeks, or shallots in a bed thats had garlic rust. Thats just tempting fate! If your crop of garlic is totally covered in rust, you can use the cloves as seed garlic for your crop next year. A study at the University of California found that garlics grown from rust affected plants didn’t result in rust on the new crop of plants. So all is not lost. ← Potatoes win at Chelsea Flower show!! !